Exactly the way i had ordered. Spring Creek is a professional, classy and sturdy leather holster phone case.This is the ultimate solution for carrying your smartphone regardless of whatever protective case, or extended battery, you may have installed on your phone! Using the finest workmanship, our team of leather artisans beautifully handcraft and tailor the case to fit. Choose a left slanted cover, open a bottom opening, add a belt clip, the selections are limitless! These phone cases are beautiful. The ability to customize made it possible for me to get something for my husband that is perfect for the way he ears and uses his phone. The people were helpful and careful. I received my iPhone 7 with battery case right on schedule. The material and workmanship were excellent. I can't ask for more and would recommend to my friends if they are looking for a smart phone case. Thank you and keep up with the great work. It was made to my specifications perfectly, I would highly recommend this to anyone who needs one! Outstanding workmanship and meticulous attention to detail makes my new phone case a work of art! Needless to say, I am extremely happy with my purchase and will definitely order from you again in the future!!! I am from England and could not find what I was looking for in a presant for my husband. Then I found Storyleather online and it looked perfect - I could customise the product to fit my needs precisely. The website implied worlwide shipping, so I entered all the details of what I wanted and hoped it would be as good as it looked online. Well, not only was it beyond what I'd hoped for in quality and function, the attention to detail shown in order to get my order perfect was outstanding. Variuos emails AND a call to my mobile, having taken into account the time difference, was impressive customer service. ...and was my husband happy with his gift? Over the moon with it. Thankyou so much. Sandra from Surrey, England. I was not sure if I would be able to get what I wanted. However, that concern was for naught because by working with the folks at Story Leather it turned out perfectly. I expect to be able to use it for a long time to come. Thanks everyone who worked on my case! The Story folks worked with me to make sure every detail was as I wished. Very good quality, perfect fit for my Note 5. The only negative thing - manufacturing&shipping takes quite some time. My phone case is beautiful and superbly constructed. The belt clip has a locking loop that prevents it from being knocked off my belt, but still allows it to slide along the belt to where I prefer it to lie. The design allows the phone to be pulled out from the case easily, in my case with a magnetic clasp for the top flap. This is a high-quality case - a bit pricey, but excellent value. The online custom-ordering process worked smoothly. I received an email to confirm the phone dimensions (the "measure twice; cut once" rule), and the custom order took about 4 weeks to arrive. I am 100% happy with it, and would happily order another one if my future phone has significantly different dimensions. The best smartphone cases you can buy and are really built to last and look good wearing on your belt everyday with a $600 to $800 smartphone inside. I am very pleased with the look and quality of my new custom-designed phone holster. It's a tad stiff, but I suspect it will take a while to break in, like other high quality leather products. I'd recommend this product to anyone. Just get it. I bought this holster for my husband so he could keep up with his I-phone. Before he would look for it on his desk, in his briefcase, on the counter, in the car, etc. Now it is secure and clean in one place. It is worth every penny and will last for years. The only mistake made was mine. I ordered a black case with a Napa gold lining which I thought was a dark mustard color. Turns out Napa gold is bright yellow shiny foil. Just my mistake but am passing it on so you will know. Otherwise it is perfect. OK, I'm VERY particular about cases for my phone. Since I'm regularly involved in meetings with professionals, I want something that looks good, is durable, is well-made and fits the phone properly. Yes, you can find less expensive products, but this one is worth every penny. The quality is absolutely outstanding, craftsmanship is truly "artisan" quality, the product fits the phone perfectly, and I've already had several of my colleagues ask where I got it. I've purchased several products from Storyleather, and every one of them has been as close to perfect as you can get. I highly recommend this company and its products. Five stars across the board. Excellent quality and perfect fit for my iphone 6. Need at case to hold my iPhone 6 plus and the external battery. So the Spring Creek case look great on the screen, nice style lines and so many colors to choose from. the custom case holds everything nicely. Excellent case very well made and definitely value for money. Very happy with my new case. Phone fits great. A wonderful quality made product. I highly recommend Story Leather. double checked my information, which proved to be incorrect. If anyone wants the case made correctly-CALL STORY LEATHER!! I purchased a custom belt case for my iPhone 6s, and I can tell you that the materials and workmanship are superb! The choice of leathers and linings allowed me to create something to my taste, and the options on how the case is constructed let get one that functions just like I wanted. In the end, I got a case just big enough for the phone, which was my goal. Too many are way too oversized, and as the phones get bigger they are unsightly unless tailored just right like my Story Leather case. My case was perfect. 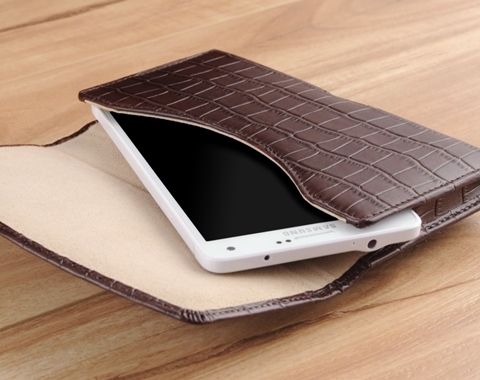 My phone with the shell fits like a glove, and the quality of the leather and construction is exceptional. It's a thing of beauty! Great quality and craftsmanship, quite impressed with Story. The materials and workmanship are of the highest quality. My iPhone 6 fits perfectly in the case. It is a very smart looking case and it doesn't go unnoticed. I'm happy I stumbled upon your site, its exactly what I've been looking for. Well made case that was delivered exactly as ordered. Haven't had it long enough yet to definitively make statements as to durability but it certainly looks bulletproof enough. I purchased a cheap, knockoff holster to fit my iPhone 6sPlus and wallet holder and it fell apart in less than 2 months. Doing a search, I found a Story Leather holster that could be customized to fit my phone and case-wallet. When it arrived I was impressed by the craftsmanship and quality. Everything fits perfectly. I appreciate the ability to get a product exactly as I wanted it. Plus, two telephone calls were made to be sure the customization was what I wanted. If you want a high quality, durable case, then Story is the way to go. I received my custom iPhone 6S holster recently and could not possibly be happier with my purchase. I ordered the holster a little wider than standard to allow for the phone to be easily retrieved and to allow room for a larger cover for the phone should I decide to use a cover with more protection for the phone. The staff at Story Leather was fantastic. They sent an email to verify the measurements I provided and even called to make absolutely sure I wanted the cover wider than what they would normally provide. While some may consider this to be an expensive holster, I would disagree. I believe it is a very sound long term investment. Selection of materials to utilize are simply outstanding. It makes for a exciting anticipation of the finished product. When the desired product arrives at your doorstep...just to witness the attention to details is quite satisfying. I proudly wear my case everyday with pride. No doubt, if anyone approaches and inquires as to where I got my case, there will be absolutely no hesitation on my part to highly recommend Story Leather. The holster case requested for the phone was of high quality. It was accurately made to my specific design requests and measurements. A beautifully functional piece and perfect fit. I had owned a premade case before from Storey, loved the high quality materials and fit. Then came my new monster phone 6" Nexus 6. I now had the opportunity to customize my case. What a great job they did, the fit is perfect (including my thin case) and again the quality is like no other. Finally got my new case and it is perfect. well made and superb attention to detail. I am a happy camper! The online order process was simple. The end design of the phone case matched the delivered product. The product has a high quality finish and perfect fit. The case was easy to order and arrived just as specified. It fits my phone exactly and is the best quality phone holster I have seen. Thanks for a great job! Worth every bit of the cost, one of the most beautiful cases around. When I received my custom made phone case I was a little concerned because the fit was so tight and then I realized it was entirely leather and contained no elastic. By the end of the second day, the leather had stretched to where I can now easily get my phone out of the case, but with still a snug and secure fit. I am very satisfied. I found your company by accident and in looking at the material and then getting the product it was great. It looks classy and I really like it. I will be a customer from now on. I found Story Leather after searching the internet for a holster case for my wife's I Phone 6. Her previous holster cases for her other I Phones just weren't made of very good materials and they always seemed too tight on the phone. After receiving her new holster case I can say that it is a high quality product made of quality materials. The fit for the phone is excellent. We will definitely buy from Story leather in the future. I actually bought two of these, one in brown and one in black and they were a gift for my father. The quality was incredible and they were made to the exact specifications that I wanted. The phone fits perfectly, you can tell these cases were made for that exact phone (an iPhone 6 in his case) and there's enough room that he can use the hard slim case he has on his phone. I even got his initials on it. Totally worth the price. You get what you pay for, trust me. I just received my IPhone 6 case and I am very impressed with the quality and workmanship. I hope I will have for as long as I have the phone. I found Story Leather when the iPhone 5 was initially introduced and was looking for a holster case. I got the snake pattern and it was awesome. I was disappointed the snake pattern is no longer offered. 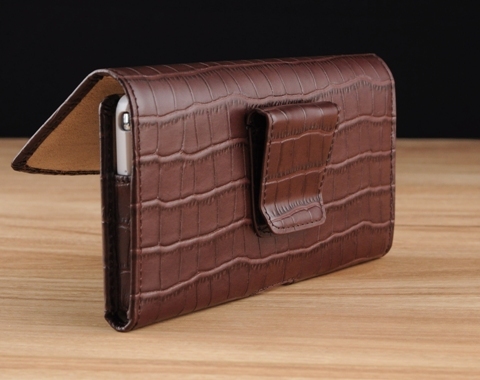 I got the crocodile case for my iPhone 6 Plus and I agree with the review above - great case but a little too tight of a fit. It has stretched out a little but some extra room would be better. I just received my custom iPhone 6 case with pant clip. I have to say it has met or exceeded any expectation I had with respect to quality, and execution of craftsmanship. I will wear it with joy, clipped onto my scrubs in the ER. Thank you! I am very pleased with my new leather case for my iphone 6. It is very well made and consists of quality materials. The ordering process was also very easy. I would definitely use Story Leather again. I recently purchased an iPhone 6 plus for which I added an iBlason battery pack. This required an extra large holster. The folks here at Story Leather custom made mine to the requested specs. The size, fit and function are perfect. I couldn't be happier with the product. The case is very well made, I have no qualms about recommending it. My only comment is that the iPhone 6+ is a little tight, that makes it hard to get out in a hurry when the phone is ringing. I never had this problem with my Story Leather Note 2 case. My only recommendation is to go with a dark color on the inside. The lighter colors will eventually look dirty. I had the yellow on my last one and it is patterned with grey from rubbing by my hand or phone going in or out. I suspect it's from the oils from my skin. STORY LEATHER UPDATE - The holster may be snug due to the leather selected, however, it will stretch to the right fit after 1-2 weeks of consistent use. Finally I found phone case which last more then 3 months. In fact I haven't been able to wear it out. Just looks better and better. I've always worn a belt holster for my phones but in recent years it has become more difficult to find custom fitting cases in the large stores; too many models to support, I suppose. And the ones I have been able to find are of increasingly poor quality and durability. The Spring Creek I ordered from Story Leather, on the other hand, is absolutely top quality; very finely crafted with quality leathers and workmanship. The only things I would prefer would be a very slightly larger internal dimension to make quick removal for calls a little easier (I ordered mine to fit without a protective case), and a larger hole in the bottom to assist with removal of my Note 4. As testimony to my satisfaction with Story Leather's product quality and service, since receiving my Spring Creek I have ordered another case of a different style for my wife's Note 2. Well done, Story Leather. Exactly what I wanted. Very professionally done Class A++++. Couldn't have asked for anything better!!! First class workmanship, quality and materials!!!!!! Anyone wanting a quality case for your expensive phone, this is the place to get it! Pebble leather with magnetic closure, and wide belt clip. Perfect fit for my iPhone 5 Plus and case...Outstanding craftsmanship! I love it, and may order another on of a different color for different occasions. I did a lot of research before buying a custom case from Story Leather for my iPhone 6. The quality of their products looks good on their web-site. The actual product is even better! I ordered a custom fit case for my phone and I can only write that is awesome. The build quality and fit is perfect. I would highly recommend purchasing a holster case from Story Leather. Very professional company. Called me to make sure that the measurements I submitted were correct. Product is well made, perfect fit and arrived exactly when they said it would. The quality of the product as advertised. Highly recommended. Exactly what I wanted for my IPhone 6. Great quality and leather. I have a side case with a magnetic closure and leather covered wide belt clip. Just know what you want when ordering and you will not be disappointed. Great Quality, Great fit, took exactly 30 days as stated when order was placed. Very well constructed. I use a thin silicon protective case with the phone and Story's custom case was made to allow for that. Very well constructed and beautiful leather. 6 weeks is a long time, so not for those that need it in a hurry. The Case is absolutely beautiful. Quality & Workmanship is superb. The only thing I would recommend is getting a clip on the back that has the Snap or use the one that goes through the belt loop. I got the Wide Belt clip on and it COMES OFF EXTREMELY EASY. I do not use an unusually large belt but I think with the leather it just is smooth enough to be pulled off very easily. The case itself if HIGH QUALITY and would definitely recommend this with the above mentioned options. I ordered this case with a magnetic closure and a belt loop rather than a clip. I've had clips in the past and had problems. As others have noted, seat belts tend to dislodge them. I had one come off my belt in a rental car and fall down between the seats. Luckily, I felt for my phone as I was walking away from the car. This is a really well-made leather accessory; I like owning and using it. Everything works as it should. Not cheap, but well worth the cost. I am so happy to have found the website of Story Leather after purchasing the new iPhone 6, which is not "pocketable". It was easy to fill in the details, and they were honest upfront about the delay in shipping as they manufacture to order. No problem. I ordered on September 26 and my case arrived on November 7. Things take a little longer getting through the Canadian border. I am very happy about the product and recommend Story Leather. I had purchased from other companies 2 previous cases for my iPhone 5s, and neither of them fit well. One allowed the phone to flop around inside the case and the other fit the phone so tight that it was a struggle to get it out of the case. Each one of these cases was supposedly for the 5s. When I discovered StoryLeather on-line, I thought I would give them a try. As custom made case is a bit pricy, but you get what you pay for. The case I received from StoryLeather was perfect. And, the workmanship is excellent. I'm very happy with my purchase and I'm sure I'll get many years use out of the case. I ordered this product when I first placed my order for my new iPhone 6plus. The case arrived after about 21 days and I was impressed by the quality and craftsmanship of the case. It fits my new iPhone 6plus like a glove and I would highly recommend this product to anyone looking for a quality case for their phone. The craftsmanship is excellent. The fit is great and the look is fantastic. While waiting for the case to arrive, which takes about six weeks. I started using a protective case. I have come to like the ability to grip the phone better and wish I had ordered the case to allow a phone with skin fitted for it. phone fits very well no excess movement will moving around. Colors what I picks from the website. Belt clip is strong. As with my iPhone 5, when the iPhone 6 came out I wanted a Case that would fit perfectly and was made with great craftsmanship and quality. I turned to Story Leather again for my iPhone 6 Case, as I did with my iPhone 5 Case. The Quality of the product is second to none. My iPhone 5 case still looks like brand new even though I had been carrying for several years. The iPhone 6 Case was a perfect fit and of course the quality is as great as the first case. When I need a Customer Leather case, I always return to Story Leather. Quality is the best. Overall this is a very nice case for the new iPhone6. The leather quality and workmanship are excellent. My only slight complaint is that it is a bit difficult to get the phone out of the case when the case is worn on a belt, even when pushing upward on the phone through the opening in the bottom of the case. This could easily be solved if the corners of the "front body" were rounded off a bit more and made a bit lower. This would allow you to grasp the corner of the phone more easily. This is the fourth of the five iPhone wallets I have ordered from Storey Leather (three double stacks and two singles for IPhones 4S, 5, 5s and 6. The fifth is in production at this time. I have been very impressed with the products I have purchased and the professional team with whom I have had contact. I would recommend these products to anyone. I had a slight delay in delivery but the case fits my phone like a glove could not be happier.Thanks for a perfect well made case. I AM REALLY PLEASED WITH THE PRODUCT AND THE PEOPLE THAT HELPED ME WITH IT. IF ONE SHOULD EVER WANT A PHONE CASE MADE TO PERFECTION STORYLEATHER IS THE PLACE TO GO. One call custom holster. Last one ordered two years ago still great but have a need for a larger holster. Phone easy in and easy out but secure. great craftmanship. I am a Type 1 diabetic and recently started using the Dexcom G4 Platinum CGMS. While the case that came with the device is a leather case and is specifically designed for the device, I wasn't thrilled with it so I went looking for nice alternative option. I was looking around because I read a few sites for people who were using MP3 player cases as alternatives. In my search I came across StoryLeather.com. I started poking around was starting to like what I saw. I liked the idea of being able to custom configure everything for my purposes. I got side tracked looking for the options for my iPhone 5, when I decided to ask through the chat window if it were possible for them to make a custom case for my Dexcom and they said the could as long as they had the dimensions for the device itself. So, I went to it configuring a Spring Creek case with all of the features, colors, and materials I wanted. Where the OEM case that comes with the Dexcom G4 folds out so you can see the display and push the buttons without taking it out of the case, the Spring Creek requires you to remove the device to see the display and access the buttons, but it was the snap closure and the viewing window on the OEM case that I didn't like and the reason I went shopping for an alternative. A few weeks later it arrived and it was perfect. I couldn't be more thrilled with the product and worth every penny. I'm fairly fussy, so that's saying a lot. If I needed to list one complaint, it would be that it is ever so slightly too big, but not enough to warrant changing it. If anything it keeps it easy to take in and out of the case. This is the second Samsung Galaxy 4 case I've ordered from you!. Bought a black one for Christmas and a brown one for Father's Day. Both are exactly what my husband had envisioned. The leather is beautiful and the stitching is flawless. Maybe I'll get to purchase one for myself soon!?!?! Thanks for the superb workmanship and the easy to navigate website. Outstanding quality & craftsmanship, superb. I got mine customized for an iPhone 5S with Lifeproof Fre case. It fits the cased phone perfectly, and looks sharp on my belt! 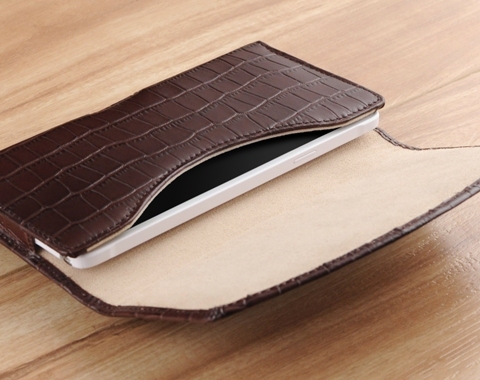 I recently ordered an ostrich (leather) case for my iPhone. It took about a month to arrive but it was certainly worth the wait. It is beautiful and very well made. The ostrich pattern on the leather looks exactly like real ostrich leather. I ordered mine in black with a black chamois interior lining. Very striking! I would definitely buy from Story Leather and will happily recommend them to my friends. I ordered a custom cell phone case. It is very high quality and I was able to get exactly what I wanted without compromising amongst other brands out there. I gave my sizing for the protective cover I have on the phone and the case size came out perfect. I just got a new smartphone, a Galaxy S4, and wanted a belt carrier of high quality. The Story Leather carrier is the best around! It was very easy to custom design online to meet my own needs, and I have seen no other product that has the quality of this one! It's not often, anymore, that you find a company delivering exactly what they promise with great value on the receiving end.......you guys provide outrageous service and quality!! I won't go anywhere else, ever again! I carry my phone every day, and every time I use it, I am reminded of the quality of the product and buying experience........the holster will outlast me. I had a hard time deciding which case to order and contacted Story Leather by e-mail to indicate that there were features of several different phone cases I liked but no one stock case offered all the features I was looking for. One of the things I wanted was a pocket for some credit cards/cash but I did not see that in the Spring Creek case style that had the most features I was looking for. Connie indicated that Story could "build a custom pocket" in the Spring Creek case and I quickly I placed my order. I understood that I was ordering a custom product and that it would take approximately one month to receive my order, however, the wait was well worth it! I received a wonderful product with the exact specifications I requested. The craftsmanship is excellent and the quality is superb. I will definitely recommend Story Leather to my friends and am quite pleased with my new phone case. Very Very pleased with my purchase. I was so glad to see a quality product that was built to exacting specifications for my phone. It was money well spent. I highly recommend anyone needing a quality, well built, phone holster to purchase from this company. Bottom line is you pay for what you get and it is worth every penny. I needed a top quality case attached to my belt that will last and not break down as all others that I have purchased in the past. Once I received this case I am pretty certain this cas will last. Thank for the craftmanship. Well Done! Just got the shipment today, and they were perfect! Thanks Story Leather, you guys are the best! I am very impressed with my phone case for my HTC One. I was a bit apprehensive to spend so much for a phone case but after wearing out lesser cases I decided to take the plunge and I am very glad I did. Customer service was great in that they contacted me to confirm exactly what I wanted and when the case arrived two weeks ago it was exactly what I had ordered. Workmanship and quality of product is great! Would buy another case from StoryLeather when the need arrises. I am really happy with my new phone case. I waited a while, so I could give a valid review. It really is outstanding. My phone fits perfectly, the leather feels so good, and it looks so good. I have received many complements on it. Prior to ordering my Story leather phone case, I ordered a few on line, that said their cases would fit my phone, and when I received them, they were too tight, making it hard to pull my phone out of the case, or it just wouldn't fit. I know, Story leather made to order, phone holsters are more expensive than the cheap holsters, but I am telling you, this case is so worth the extra money you will pay. The sizing, the workmanship, the quality, and the looks of this holster, really is outstanding. You carry your phone every day, so why not carry it in a really cool, well made holster that you can be proud of. The next holster I order from Story leather, will be the black crocodile leather holster. I won't by phone holsters any where else. As advertised. Love it! Thanks. I'm looking forward to getting another for my next phone. This is a well made product. iPhone 5 in otter box defender case fits very well. I will most certainly recommend you to friends and associates. Very pleased with the product, beautifully made and delivered as promised on time. I had so much trouble finding a case to fit my new IPhone encased in a Otterbox case, so I searched the web to find a site where I could order a custom case for it. I was thrilled to find this site where I could choose all of my options for it. The phone fits snugly in the new case, and I love the true leather feel of it and not an imitation. I would highly recommend this company to anyone looking for a good quality case to protect their investment. Pricey but well worth it. I am very satisfied with the craftsmanship and quality of my iphone 5s leather case from Story Leather. I've had a number of leather cases in the past; Case-Mate,Sena, Mapi,etc... Story Leather is by far a more superior product. It's a little more expensive, but the custom make and measurements, and the durability will probably more than make-up for the difference in price. As the saying goes... "You pay for what you get!" Story Leather is well worth the price! I am so happy to finally have a case that fits my phone and does not fall off my belt when I move. Excellent quality!!!! I will purchase from Story Leather again!!!!! This is by far the most incredible iphone case made to fit perfectly anyone can purchase!!!! Well made. Fits exactly as I specified. Expensive but you get what you pay for. Well done! I have two questions: 1. Can this case be made with a slot on the inside to hold business cards? 2. Can the case be made so that it is a tight fit for the phone. The S8+ is a larger phone. I bought a case online and it feels like I have a brief case hanging on my side. Due to always wearing suits, I am interested in a slim fit case that has as small of a footprint as possible while still big enough for the phone. 1. Yes, if you would kindly go through the custom design process, and note in the Special Request section for us to add an inner pocket for 1-2 credit cards, our team will gladly accommodate this request free of charge. 2. Yes, we normally make our cases to have just the right fit, and that would be why we ask for either precise dimensions (if you are using a 3rd party casing on your phone), or if you are using just the bare phone. All custom orders are tailor to fit and have that slim fit you are looking for. Where does my name get place don the case? By default the name stamping and logo stamping are placed on the front cover's bottom right corner. If you do wish to place your logo elsewhere, please kindly note this in the Special Request section as you go through the customization process. 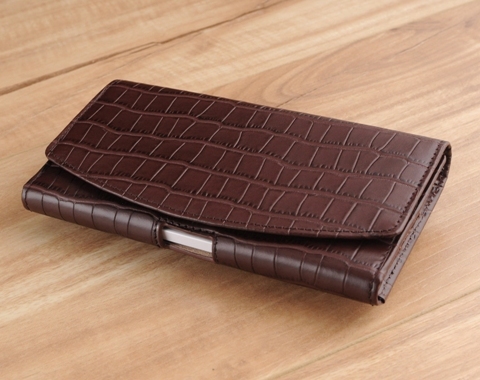 I don't like brown crocodile, can I have this in another color? I have a Mophie Juice Pack with my phone, will this case fit? Yes we do ship Internationally. We charge a flat rate shipping for all International orders for $29.99. For Canada, we charge $19.99. If you wish to have it shipped via FedEx, please kindly contact us after you have placed an order, and we will gladly provide you with a quote for FedEx shipment. Please note that shipping cost doesn't cover for customs and tariffs that may be imposed by your country. Can I make this case to hold a Medtronic device? or an iPod music player? Yes, for this particular style, we can make this case to fit any device as long as we have the proper dimensions. Please do note that we do charge an oversize fee when cases have dimensions greater than or equal to 6.69 in. / 17 cm. This fee will vary depending on the dimensions provided. You will be informed of the fee after your order is reviewed by our production team. Where do you put the stamping or name on the case? By default the name stamping and logo stamping are placed on the front cover's bottom right corner. If you do wish to place your logo elsewhere, please kindly note this in the Special Request section as you go through the customization process. Other possible locations would be inside the cover , top center-aligned, or back side of case. For slant cover styles, the stamping would by default be on the body opposite of the slant cover.